In Star Trek, all the doctor has to do to diagnose diseases is to hold the medical tricorder in front of a person, wave it around as if doing voodoo, and wait for the diagnosis. 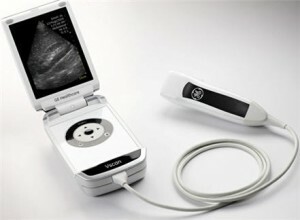 GE’s Vscan, which came out early this year, is an ultrasound-imaging device that is only the size of a smartphone. The handheld device obviously will not diagnose all kinds of disease, but it is a step towards handheld diagnostic equipment. It can help measure and analyse data relating to abdominal issues and even more critical things, like cardiac issues. Physicians are quite enthusiastic about the device, since it does help a lot in early diagnosis. Instead of having to schedule their patients for ultrasound, they can already perform it wherever they may be, whether that be in a clinic or in an accident site. It is also very handy, weighing less than 3 pounds, and has a battery life of more than 1 hour. It has its own battery charging station and can be connected to a printer and other add-ons via its USB port. The VScan is available in the market for only $7,900. (Yeah right, ONLY!) Definitely not a toy to be bought for mere amusement, but well worth it for doctors, especially those that are part of emergency response teams and those located in remote areas.